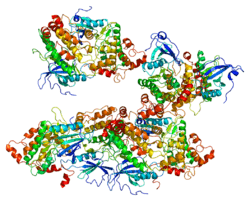 Death-associated protein kinase 2 is an enzyme that in humans is encoded by the DAPK2 gene. This gene encodes a protein that belongs to the serine/threonine protein kinase family. This protein contains a N-terminal protein kinase domain followed by a conserved calmodulin-binding domain with significant similarity to that of death-associated protein kinase 1 (DAPK1), a positive regulator of programmed cell death. Overexpression of this gene was shown to induce cell apoptosis. It uses multiple polyadenylation sites. The DAPK2 mRNA may undergo alternative splicing to produce a DAPK3-like encoding transcript. ↑ Kawai T, Nomura F, Hoshino K, Copeland NG, Gilbert DJ, Jenkins NA, Akira S (Jun 1999). "Death-associated protein kinase 2 is a new calcium/calmodulin-dependent protein kinase that signals apoptosis through its catalytic activity". Oncogene. 18 (23): 3471–80. doi:10.1038/sj.onc.1202701. PMID 10376525. 1 2 "Entrez Gene: DAPK2 death-associated protein kinase 2". ↑ "New Modularity of DAP-Kinases: Alternative Splicing of the DRP-1 Gene Produces a ZIPk-Like Isoform". Inbal B, Shani G, Cohen O, et al. (2000). "Death-Associated Protein Kinase-Related Protein 1, a Novel Serine/Threonine Kinase Involved in Apoptosis". Mol. Cell. Biol. 20 (3): 1044–54. doi:10.1128/MCB.20.3.1044-1054.2000. PMC 85221 . PMID 10629061. Shani G, Henis-Korenblit S, Jona G, et al. (2001). "Autophosphorylation restrains the apoptotic activity of DRP-1 kinase by controlling dimerization and calmodulin binding". EMBO J. 20 (5): 1099–113. doi:10.1093/emboj/20.5.1099. PMC 145456 . PMID 11230133. Wong TS, Chang HW, Tang KC, et al. (2002). "High frequency of promoter hypermethylation of the death-associated protein-kinase gene in nasopharyngeal carcinoma and its detection in the peripheral blood of patients". Clin. Cancer Res. 8 (2): 433–7. PMID 11839660. Chan MW, Chan LW, Tang NL, et al. (2002). "Hypermethylation of multiple genes in tumor tissues and voided urine in urinary bladder cancer patients". Clin. Cancer Res. 8 (2): 464–70. PMID 11839665. Inbal B, Bialik S, Sabanay I, et al. (2002). "DAP kinase and DRP-1 mediate membrane blebbing and the formation of autophagic vesicles during programmed cell death". J. Cell Biol. 157 (3): 455–68. doi:10.1083/jcb.200109094. PMC 2173279 . PMID 11980920. Satoh A, Toyota M, Itoh F, et al. (2002). "DNA methylation and histone deacetylation associated with silencing DAP kinase gene expression in colorectal and gastric cancers". Br. J. Cancer. 86 (11): 1817–23. doi:10.1038/sj.bjc.6600319. PMC 2375414 . PMID 12087472. Barrios-Rodiles M, Brown KR, Ozdamar B, et al. (2005). "High-throughput mapping of a dynamic signaling network in mammalian cells". Science. 307 (5715): 1621–5. doi:10.1126/science.1105776. PMID 15761153. Rizzi M, Tschan MP, Britschgi C, et al. (2007). "The death-associated protein kinase 2 is up-regulated during normal myeloid differentiation and enhances neutrophil maturation in myeloid leukemic cells". J. Leukoc. Biol. 81 (6): 1599–608. doi:10.1189/jlb.0606400. PMID 17347302.